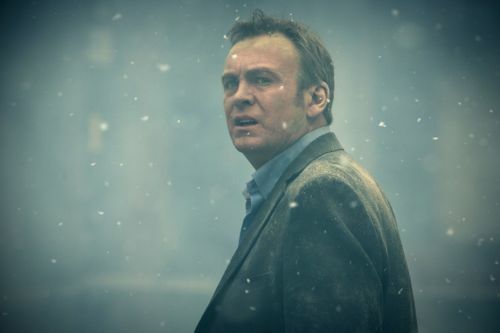 Daniel Cotton (Philip Glenister) asks the question of his father Samuel (Bernard Hill) in From There To Here. 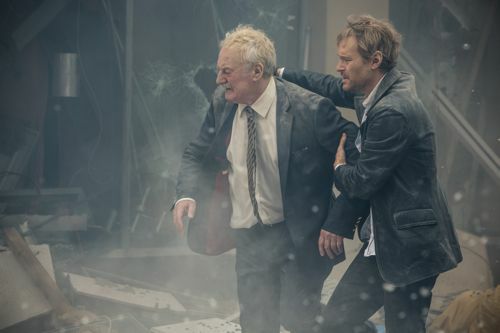 The three part BBC1 drama, written by Peter Bowker, opens with the June 1996 Manchester bomb which destroyed a large part of the city centre. But this is not a story about the IRA attack. It charts the ripples of that initial trigger on two families across Greater Manchester and Cheshire. Last night I attended a screening of episode one at BAFTA in London followed by a Q&A, including Phil and Pete. You can read my full transcript below, edited very slightly to remove any major spoilers. Including Phil and Liz White talking about being reunited in Manchester where they, of course, filmed Life On Mars together. And Phil’s response to an attempt to grab a cheap headline from him. On the evidence of the first hour and the showreel of later highlights we were also shown, this is one of the best things Phil has done in recent years. 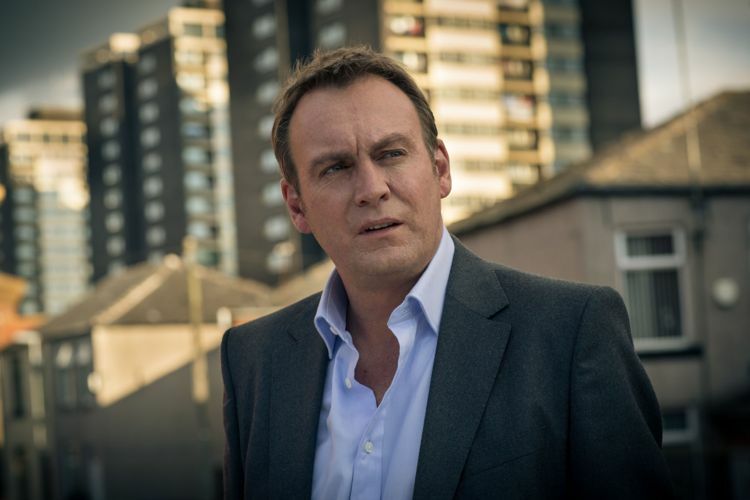 BBC Drama boss Ben Stephenson, who was at university in Manchester in 1996, described it as “a towering, moving, really surprising performance”. Director James Strong, whose previous credits include Broadchurch, told the Q&A how he experienced the 1996 blast for real in Manchester that day. 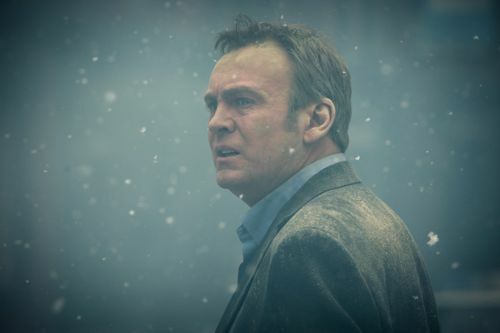 He begins episode one with the closest look at Mr Glenister’s eyelashes you are every likely to get. 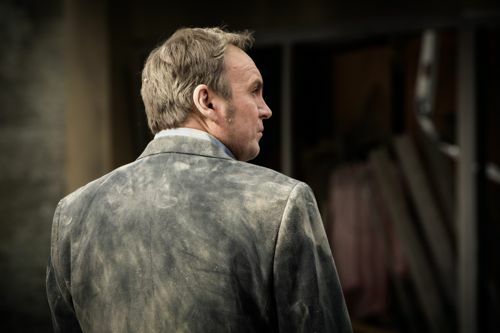 “Still alive,” Daniel remarks to wife Claire (Saskia Reeves). 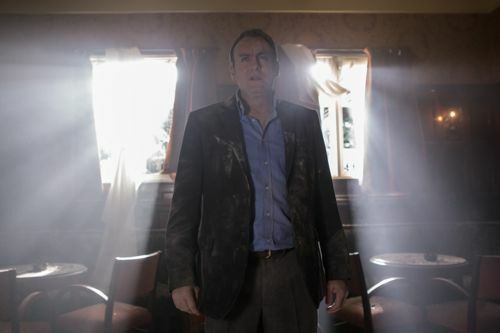 Before he heads from their luxury Cheshire home to a Manchester city centre hotel where Daniel is hoping to broker a peace deal between his wayward brother Robbo (Steven Mackintosh) and their father Samuel. Daniel having been adopted when he was around five years old. It’s Saturday mid-morning and the hotel bar is otherwise empty, aside from cleaner Joanne, played by Liz White. Who is a single mother of two boys. 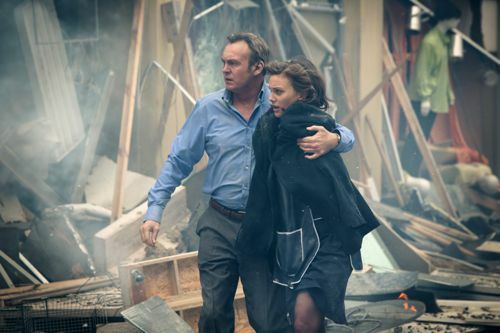 Philip Glenister as Daniel and Liz White as Joanne. 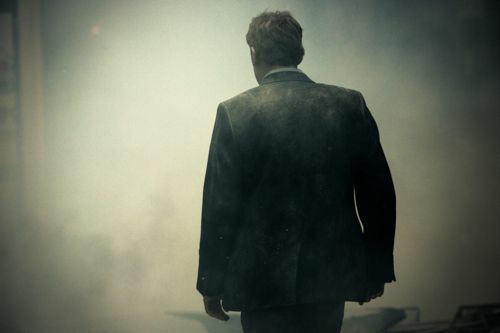 You could hear that pin drop in the BAFTA auditorium when the bomb went off on screen. Pete’s script then follows those ripples from that summer of football, through New Labour’s triumph in 1997 to the Millennium celebrations as 1999 turned into 2000. There is much to love about From There To Here. 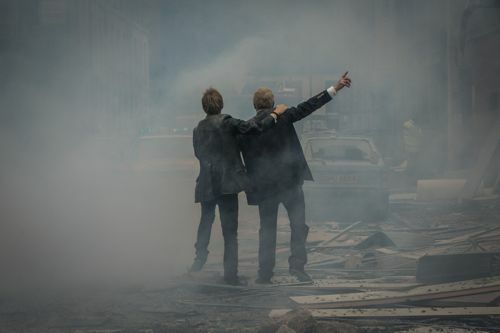 Not least the slices of humour, such as Daniel’s immediate thought after the explosion. The music, including classics like I Wanna Be Adored by The Stone Roses and an original score by I Am Kloot. Both of which capture the smell and feel of Manchester. 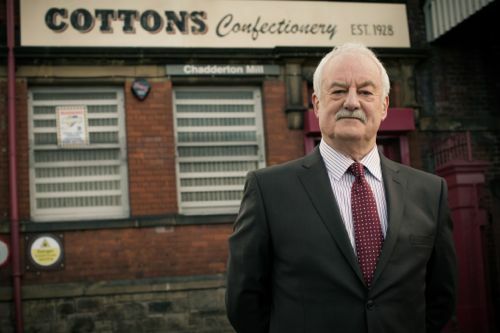 Samuel is the head of Cotton’s Confectionary, a Chadderton sweet factory, where Daniel also works. With shades of Phil back in Clocking Off’s Mackintosh Textiles. Daniel Rigby and Morven Christie co-starring as Daniel and Claire’s childen Charlie and Louise. 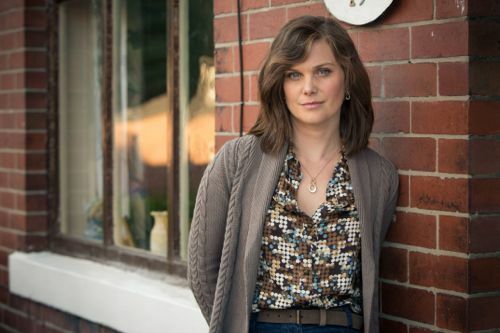 From There To Here begins on BBC1 at 9pm on Thursday May 22. Q&A with director James Strong / writer Peter Bowker / executive producer Derek Wax / Philip Glenister / Saskia Reeves / Liz White. Chaired by James Rampton. Q: Derek – tell us how you developed this project? Q: Obviously the bomb is a very dramatic opening. Why did you decide to use that as the opening and how did you develop it from there as a catalyst for the story? 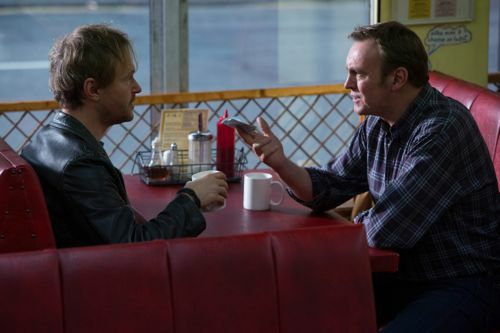 Q: Phil – what appealed to you when you first read Pete’s script? 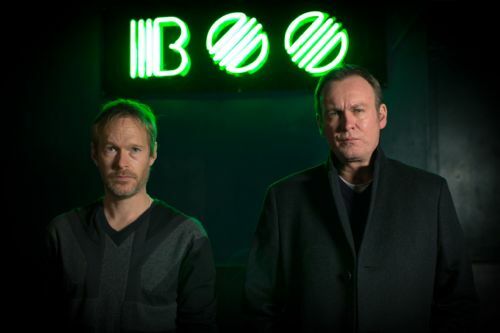 Bernard Hill as Samuel and Steven Mackintosh as Robbo. Q: Saskia – what drew you to the project? Q: Is it particularly a problem with male inarticulacy do you think? Our inability to express what we’re really feeling? 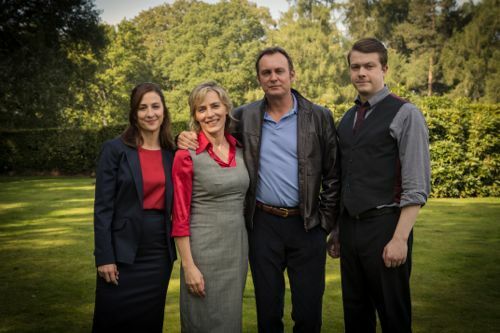 Liz White as Joanne with her screen sons in the pub plus Philip Glenister as Daniel. Q: Liz – tell us about your character (Joanne) and what appealed to you about her? Q: James – you were there in Manchester on the day of the bombing? Q: Those scenes are very vivid and very powerful. Were they hard to make and were you aware of local sensibilities? Q: And I understand you had a very good reception in Manchester last night? What did people in Manchester say about it? Q: You called it a love letter to Manchester, Pete. Could you expand on that? Q: (From me) While I perhaps should ask Pete why he didn’t use dramatic license to change the result of that (England v Germany) penalty shoot out…can you expand, Pete, on the themes of second chances or fresh chances? Q: A question for Phil – a slightly nerdy, motor car question. How was this Audi to drive compared to the Quattro in Ashes To Ashes? 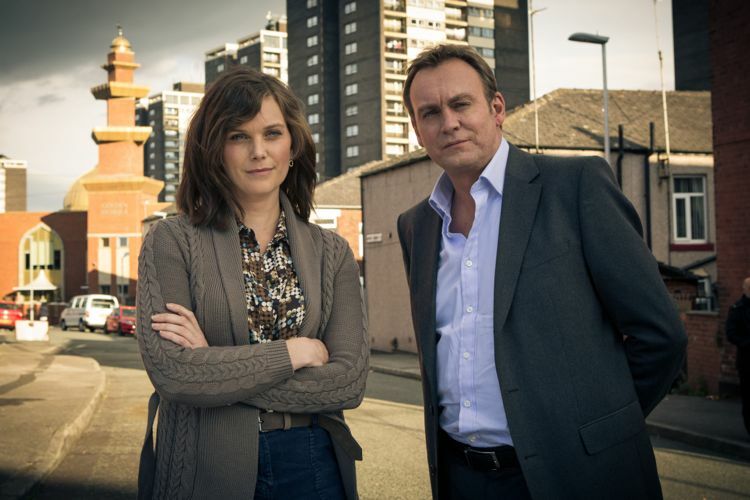 Q: I wanted to ask Phil and Liz if they found it strange working in Manchester together again (after Life On Mars). Did they recognise many of the locations? Q: The use of music is brilliant. Why is the music so important? Q: I apologise – this is another nerdy question for Phil. If Gene Hunt were around today, do you think he could be persuaded to stand for UKIP? Posted in News and tagged Ashes To Ashes, BBC Drama, BBC One, Ben Stephenson, Bernard Hill, Daniel Cotton, Daniel Rigby, Derek Wax, From There To Here, Gene Hunt, James Strong, Life On Mars, Liz White, Manchester, Manchester IRA Bomb, Peter Bowker, philip glenister, Philip Roth, Saskia Reeves, Stone Roses. Bookmark the permalink. 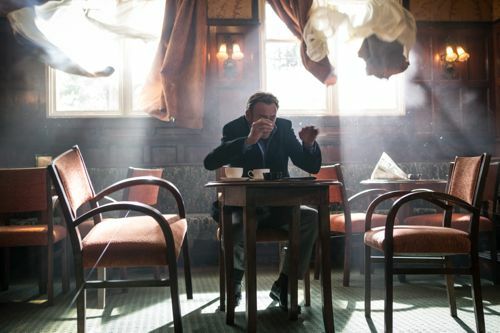 LOVE Glennister and White together and I’m sooooo looking forward to what looks to another great British drama! Where can I listen to the background music from there to here? No sign yet of the I Am Kloot original score being released but you can listen to / buy their original tracks used in the series along, of course, with the others from various bands etc.